How do you react when you have to fill a long form while registering on an online store? Ahh! Yet another form, yet another password to remember! Can’t there be a simpler process to register in a jiffy? Thankfully, your wish can be granted if the website has implemented social media login integration. Tell us honestly, wouldn’t you rather abandon the annoying registration process and switch to another site to complete your online purchase? We know how big a menace cart abandonment is for ecommerce stores with close to 70% customers leaving their checkout incomplete.Long registration process along with complicated checkout are two major contributors to incomplete checkout. Social logins can make a huge difference here by giving the customers an easy option to register with their Google+, Facebook, LinkedIn and other social platforms. Let us delve deeper and try to understand how social login for ecommerce works and helps online businesses. Why customers hate online registrations? With the expansion of IT and Internet-based services, our daily lives have changed remarkably. Our dependence on technical gadgets and security processes makes it mandatory to remember and use at least a dozen of unique password combinations daily. Adding another password to this list is not only annoying but ultimately frustrating for an average user. Social login is extremely important for all businesses with an online presence as it improves your ability to convert and understand your online users. Social logins are simple and quick and hence preferred by customers. A simplified registration process ensures you get more signups when compared to creating another password-based login. It also means that the users are using their real profiles when opting for social login for ecommerce thus automatically keeping your database clean and segmented. Mobile is the most preferred device used by online shoppers for completing their order. From personal experience, we know that entering passwords on mobile can be a pain and result in multiple failed logins.The whole process can be made simpler and more familiar to users by offering them the ease of logging with their social credentials. Social sign-on can help to boost conversions significantly by making the ordering process simple. If the login process before checkout is lengthy impulse buyers tend to abandon the cart more frequently. By activating social login for ecommerce you can ensure more impulse and mobile orders on your online selling website. With the help of the social profiles of your customers, you can gather more data and better insight into their choices and buying behaviour. This can help you segment your data and set goal oriented targets. As a result, you can target your customers better and improve your marketing ROI. Customers agree to share certain social details when they sign-on using the social media login integration on your website. Social profiles of users offer you more exhaustive details about their lives and preferences. You can use these details to offer more engaging and personalized experience to your customers when they visit your store. With so many advantages it is obvious that online businesses that have not yet implemented social sign-on are missing on some huge benefits. StoreHippo considered this aspect and made social-sign on an integral part of its latest offerings. How to implement social login with StoreHippo? That’s it and you are set to go! Staying true to its core value of offering a flexible ecommerce solution, besides allowing users to configure their own Login Providers, StoreHippo also offers built-in ready to go social login options that are turned on by default. Simply speaking, this means you need not configure the login provider using your own credentials if you opt for the following social login examples like LinkedIn via StoreHippo, Google via StoreHippo or Facebook via StoreHippo. These are available as an option in your admin panel. You can get a stepwise detailed guideline on adding social logins to your online store by visiting StoreHippo Social Login Providers page. 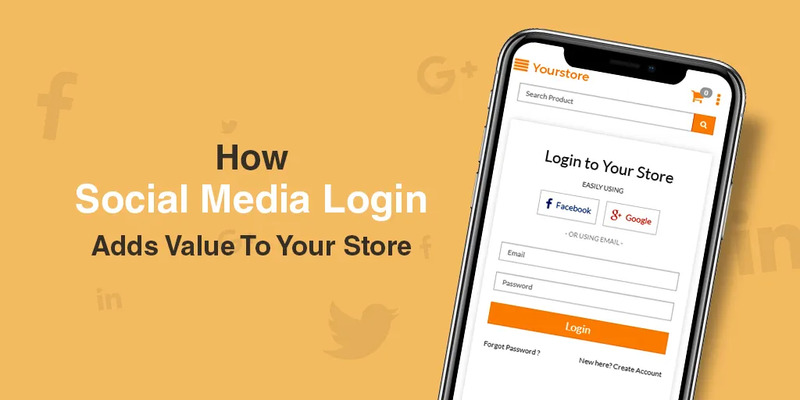 Online buyers are always connected to their social profiles and adding a social login to your website adds value to your website. The users want to have a simple login on the sites they use for shopping and by offering them social login you would be giving them exactly what they want. We have already seen the numerous benefits this process can bring to your business. So what are you waiting for? Go ahead and implement social media login integration on your website to gain an edge over your competitors.